[prMac.com] The Hague, The Netherlands - Steve Gadd comes to the iPad and iPhone as well as iPod touch and has recorded a vast array of drum loops and fills in corporation with Go Independent Records, the company from the Netherlands that has previously released apps like Drum Loops HD and Percussion Loops HD. 50 Ways to leave your lover, Late in the Evening, Roof Garden, Aja!, Eric Clapton, Paul Simon, Chick Corea, to name a few of Steve Gadd's highlights in the last 40 years. He is and has always been the example to many drummers in the world today and who would not like to play along with him, to jam with the master of his craft. Well, Steve said it was time to release this in the most modern and progressive format today, the lOS App Store. This gives any bass player, song writer, music teacher the unique chance to have Steve Gadd as the drummer on either a self made iPad recording or a session live or maybe teaching a student. Think of Steve as the only grooving human metronome in the world and you get a hint of what this app can do for a musician. Steve has re-recorded some of his best known grooves especially for this app, to be found in the 'Famous Grooves' chapter. 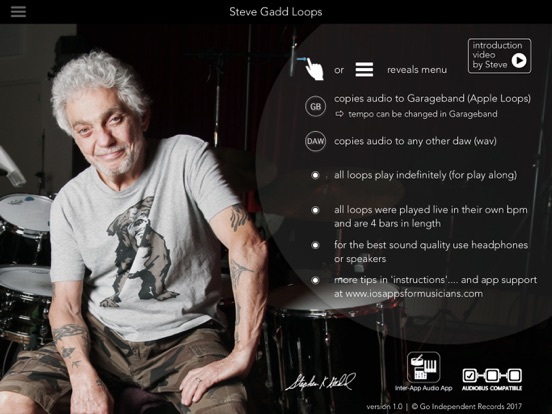 Steve Gadd Loops consists of only 4 bar loops, something Steve requested in the first meetings that led to this product, he wanted to make sure that consumers would not feel the loops as 'looped' but rather as a performance, keeping the feel as strong as possible. And, Steve plays many 4 bar loops in fact as 4 bar patterns rather than 1 or 2 bar patterns repeated so anyone can enjoy this now with the release of Steve Gadd Loops. The app comes with a lot of chapters, based on chosen styles and tempos by Steve himself and reflecting his feel, groove and style very strongly. Furthermore (like other Go Independent apps) the app features full Inter App Audio support and Audiobus support, making it possible to send Steve's groove to another similarly equipped app on your Apple device. Every loop or fill is available in 2 distinct mixes, a close miked 'dry' mix and a 'room mics added' version, giving you the option to choose or to combine both sounds within the environment of your sequencer.